The laws of the way things are5 work internally. Now, look inwards, look at your mind. When you look at mind, nothing is seen, no substance. This emptiness of experience is your own mind. It’s not that there is no mind; anything can arise. The pristine awareness that knows experience is your mind. If you experience bliss, look at the essence of bliss. This is the mahamudra of empty bliss experience. If you experience clarity, look at the essence of clarity. This is the mahamudra of empty clarity experience. If you experience emptiness, look at the essence of emptiness. This is the mahamudra of non-thought experience. When you look inwards, there is nothing to be seen. Experience drops into naked ordinary knowing. While forms are clear, they are in essence empty. 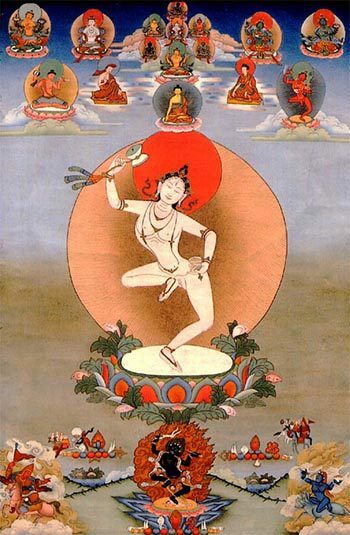 This is the experience of appearance and existence spontaneously arising as enchantment. This is the instruction for the spontaneous freeing of the five poisons. Mind is free from existence or non-existence, order or chaos. This is the holy instruction of the great middle way. There is no experience that is not complete in the mind. This is the holy instruction of the great completion. This is the view that samsara and nirvana are inseparable. This is naked ordinary knowing. This is the practice of mahamudra. Combine the two rivers, the Kadampa and the Mahamudra. The point is to attain stability in your mind. This is called the fruition. This prayer was written down on paper for the hermit Jomo by Raga Asya in a camp on Dharma Mountain in Tö. It was translated by Ken McLeod for a student who has a special interest in this practice.